Each row on the schedule is a unique resource. Scroll up and down to see them all. Jobs may use any combination of resources and the order is described in the production plan. Most resources are finite - can only do one activity at a time. But some, the last three here, are infinite - and can do an unlimited number of activities at one time. The Electronic Schedule Board (EPB) looks the same in both Monitor Mode (published real-time view for other users) and Design Mode (simulation view for planning,) but Monitor Mode is for viewing and data collection only. So you can experiment freely, Scheduler lets save and reload your board, or simply undo up to 20 times in a row. Here, the bar contains the job number, quantity, and description. Configure your bars to show any job details you want, including an unlimited amount of user-defined fields. Click more for the complete anatomy of a bar. Late jobs are clearly indicated with this hatch pattern in the bar's status strip. Click here for the complete anatomy of a bar. The Detail Panel shows job and operation details for the selected process bar, shown with a dashed border and pink background. You can edit most anything right here on the fly. Gray bars show scheduled down time. Here you see that most resources go down at 11:00 pm. Create special downbar categories for things like planned maintenance - shown to the right as a darker gray bar. You can also drag the endpoints of a downbar to add or reduce capacity on the fly. Click any bar and the whole job will become highlighted with a moving dashed border. Thin strings will connect each depended bar in the job so you can easily follow its route. Prestige Scheduler automatically enforces all the rules of the job. Here the Cutter activity is held up by the iGen. Move the iGen work to the right and the Cutter work will automatically move as well. (If you look closely you might notice that the Cutter work actually starts a little before the iGen completes. This is because the make-ready (setup) part of the Cutting work is allowed to start before the iGen has completed. Running activities will turn green and will be fixed to the schedule. The now line (vertical blue line) will continue to move with time, along with any other bars which are not running. White space is unscheduled time. Prestige Scheduler is always trying to fill this time by shifting activities to the left to start as soon as possible. The colors represent the status of the activity. Yellow is ready to run, Red is waiting, and Green is running. You can configure these and other statuses to any colors you like. Similarly, you can color the center portion of the bars based on things like Customer and Sales Rep, or user-defined fields for things like Imposition and Folder Configuration. Click here for the complete anatomy of a bar. Milestones and Materials are two prerequisites that may be added to any Part or Process on a job. Any incomplete prerequisites will make the dependent process appear red (for not ready) and the specific milestones and materials needed will show in this list. You can also assign symbols when you define the milestone. Those symbols appear here and can be added to show in the bar itself. Click here for the complete anatomy of a bar. 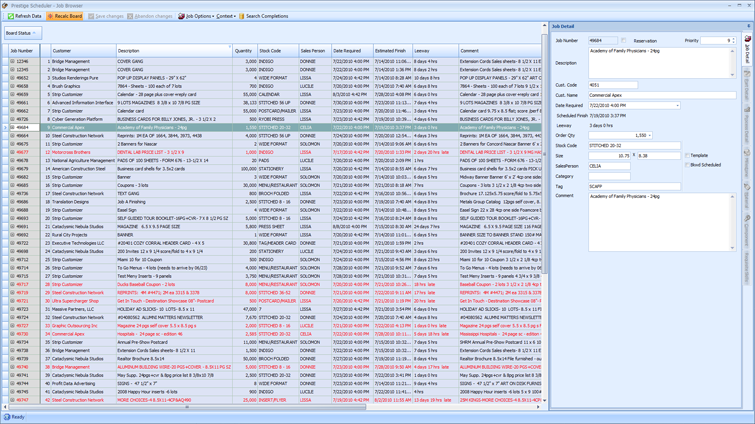 An Outlook-style grouping bar lets you organize long lists of jobs by grouping with any number of fields. Grouping, sorting, and custom filters make it a snap to find anything. As jobs are completed, they disappear from the active schedule but are kept in history. Jobs in history may be reactivated, copied, and of course, you can report on all the juicy detail. Each user can add. 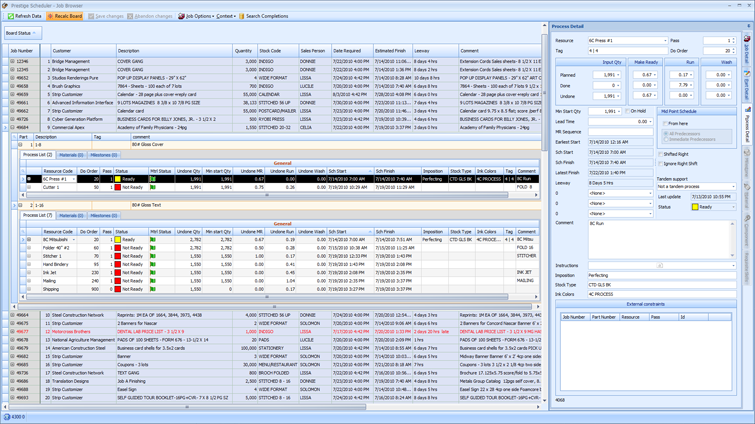 remove, and organize columns in any view in Prestige Scheduler to get important information at your fingertips. You can even add an unlimited number of user fields. Customer Code, Sales Person, and many other fields may be assigned a color scheme which is used to color code the bars on the planning board. As you select and highlight jobs and processes in the EPB or Work Lists, they are automatically highlighted in the job browser as well and vice-versa. Leeway is the amount of time between the Estimated Finish ad the Latest Finish (which the date required for the job). Jobs that are estimated to complete after the due date are in red. Template jobs, used primarily for Forecast Mode, are kept in a special group in the list so they don't mix with your actual work. Jobs in Prestige Scheduler, may be individually forward, backward, or midpoint scheduled. Backward scheduling is perfect for placing long term work on the distant schedule, and midpoint scheduling is great for managing bottleneck operations. Simply click the [+] to expand any job to see its parts, processes, materials, and milestones. Looking for a certain job? Simply click the job number column and begin typing the job number; Prestige will locate the job as you type. The collapsible detail panel is currently showing job details for the highlighted row (49684 in this example). As you drill into jobs, the detail panel displays the information for the item you select. Every job is assigned a priority. Prestige Scheduler uses the priority to 'settle disputes between jobs' on the board. You can use grouping and row pinning to override Prestige and set the work in any order you wish - Prestige will always enforce the job dependancies so you never have to worry that you've got shrink-wrapping before printing. Quantity change? Simply edit the job quantity and Prestige will offer to update all the processes and materials to adjust the quantities and times in the same proportion. The Make Ready (setup time) Run, and Wash (clean up) hours are at the heart of the schedule. Prestige uses the Undone hours to block out that time on your board. The Planned and Done hours are there for your information.The Input Quantity represents how much this process will complete in the Run hours. Enter a Done Quantity and Prestige will calculate how many hours are done and left undone. Minimum Start Quantity and Lead Time are two options to fine tune the dependency between this process and the previous one. Decreasing the Minimum Start Quantity (aka. Batch Transfer Quantity) will let this process start before the predecessor is complete. Increasing Lead Time will build buffer or drying time between the first two steps. Simply click the [+] to expand any job to see its parts, processes, materials, and milestones. This view shows job 49684 expanded to show 2 parts. Part 1 has Printing and Cutting. Part 2 Prints and Folds before Stitching. Stitching is setup to wait for the Cutting on Part 1 to complete. Each user can add, remove, and organize columns in any view in Prestige Scheduler to get important information at your finger tips. You can even add an unlimited number of user fields. Midpoint Scheduling and Tandem Support are two advanced scheduling features to control this job's workflow.Midpoint Scheduling is a hybrid of forward and backward scheduling where one or more processes prior to this one are backward scheduled to finish as close as possible to the start of this process.Tandems are two or more processes, running on different resources, that MUST run together. Its like combining two machines to be scheduled as one - if one isn't available the job must wait. Jobs in prestige are made up of Parts, which contain Processes. A process is represented on the planning board as a single bar. Each process on a part is generally run sequentially so that each step is waiting on the prior step. You can also split a step to run concurrently on multiple machines. This part has 7 processes. Prestige Scheduler has no limits to the number of parts or processes on a job. You can edit any field directly in the grid view, or in the detail panel on the right. User defined fields like these may be filled in from your MIS system with the Job Importer or hand entered. This puts any amount of information at your fingertips so you can make smart planning decisions without digging through a sea of work orders. Need to hand enter jobs? To save time, copy an existing job or any part of process from one job to another. Quantities and hours are auto-adjusted to match the target job. 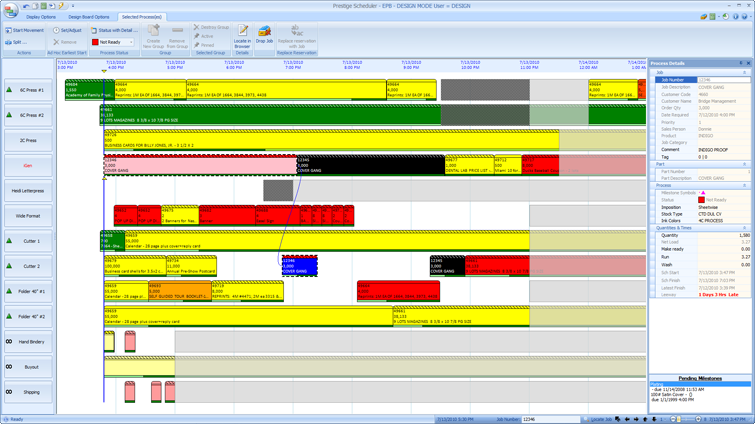 The collapsable detail panel is currently showing process details for the highlighted row (6C press #1 on job 49684). as you drill into jobs, the detail panel displays the information for the item you select. Work lists for all your resources and milestones are viewed in this screen. Just switch from list to list along the top. The current resource is the 6C Press #1. Based on the job's due date, every process in the job gets a latest finish time - effectively a due date for each step. Leeway is how far ahead or behind the scheduled finish is compared to the latest finish. All of these jobs are on time. If any were late the leeway would appear red. Click any row to select it (gray) and the rest of the job is also highlighted in blue so you can quickly see when everything is running. Depending on links to your inventory system, Scheduler will show Material Status as three different flags: Green is Ready to Run, Yellow (not shown here) is Available But Not Issued for in-house material or Ordered But Not Received for purchased material, Red is Un-Allocated. A symbol may be assigned to each milestone in the system so you can instantly see what this process is waiting on. Scheduler supports three types of groups, plus resource pinning, to let you organize and fine tune the sequence of your work, which can override job priorities. Three different types of groups are Red, Blue and Green. User fields are displayed with any job information you need to make scheduling decisions. In this example, these are the imposition, Stock Type, Parent Size, and Ink Colors columns. It's a snap to find and group similar jobs to save change-over time. Processes are automatically set to Not Ready by Scheduler if any milestones or materials are not complete, or if the preceding process hasn't reported enough quality for this to start. Every job is assigned a priority. Prestige Scheduler uses the priority to 'settle disputes between jobs' on the board. You can use the grouping and row pinning to override Prestige and set the work in any order you wish - Prestige will always enforce the job dependencies so you never have to worry that you've got shrink-wrapping before printing. The Undone Time and Undone Quantity fields show how much of this process is to do. This section shows unscheduled work for this resource. You can raise jobs from here to place them on the schedule. Share schedule information and updates with the entire company and beyond. Better visibility for all. Instant updates put your newly-designed schedule into effect instantly, once you publish your schedule. You will see every process and job adjust on the timeline automatically. Your shop floor data collection terminals and equipment counters provide instant feedback to the scheduler, which in turn, keeps relevant staff and customers up to date. Inventory management helps you make more efficient use of raw materials. You’ll know when it’s time to re-order, and how your on-hand and incoming quantities are allotted. The web-based interface gives you the option of keeping customers and remote employees looped in to the production workflow. Customers can see where their jobs are in the printing process, eliminating time-consuming calls to your staff. And on the shop floor, your operators can use the optional Shop Floor Web to input data, alert the system that a job is complete, and start and stop activities as needed. This keeps Scheduler’s operating data up-to-the-minute accurate. Secure scheduling allows you to determine who has design control, who has access to viewing and monitoring a job, and who can update active jobs. Works seamlessly with your existing systems and future investments, whether they are million manufacturing information systems like SAP or developed in house. Pivotal Z has connected over 50 unique MIS and database systems. Our goal is zero double data-entry. A variety of flexible features, customizable integration with your unique business rules, plus extensible plug-ins make Prestige Scheduler the most versatile scheduler available. Perform what if simulations that do not affect the live schedule. 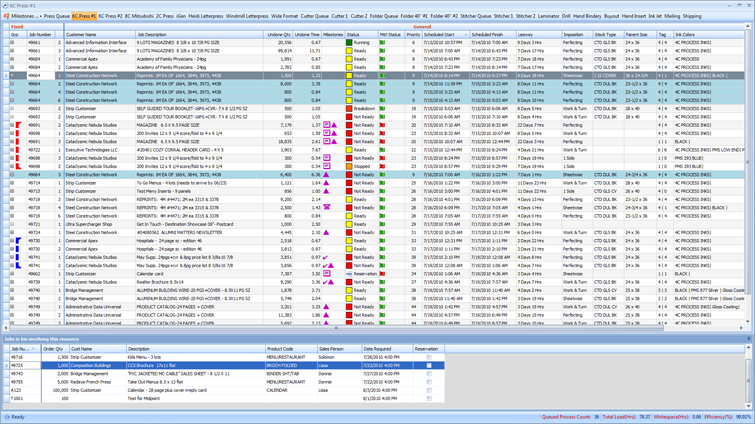 Fast enough to plan all of your jobs (and even forcasted orders supplied by your system), whether it be 100 or 5000 (or more), Scheduler can map it all out. Are you over capacity during week 3 of next August? With Prestige Scheduler you can tell. Use Forecast Mode to generate a temporary design board where Prestige Scheduler generates forecasted jobs based on special template jobs, which may recur similar to an appointment in Outlook. Once the design board is generated you can manipulate it as usual (short of publishing) and generate reports or export data for future reference. Get highly detailed information about your long term schedule, while keeping your day-to-day schedule as short as you like.